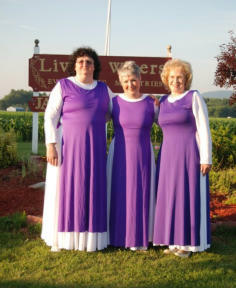 In 2005 four Vermont women who shared a love for our Lord and for dancing had a common vision to glorify the Lord through dance. After their very first dance to Mary Did You Know, an inspired favorite written by Mark Lowry, Pastor Debra Estey of the United Methodist Church in Shaftsbury called the group The Grace-Full Dancers, a name which they’ve used since. They began practicing weekly and before they knew it they were being invited to other churches to dance for the Lord. This led to several ladies from other churches joining the group, crossing deomonational lines, all for the glory of God’s Kingdom. The Grace-Full Dancers use flags in their dance and during praise and worship. This has really caught the interest of the youth at Jacob’s Well Fellowship and now it is common to see children comfortably joining in praise and worship by flagging along with the adults. The Grace-Full Dancers are available to give instruction to others interested in starting a similar ministry within their church. They are also available to come to your church or event. They will perform a single dance or an entire service.